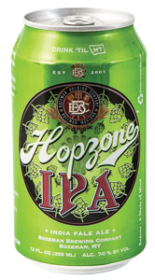 Hopzone IPA is an American beer, it has an alcohol content of 7%. ndia Pale Ales (IPA) originated in the late 1700’s when British breweries sent beer to expatriates and troops in India via sailboat. Lacking reliable refrigeration, brewers produced these ales with large amounts of hops and alcohol, which acted as preservatives for the long voyage. We start ours with five different malts to create a sturdy foundation for the hop assault, then we build on this with Columbus, Cascade and Centennial for bitterness and flavor. The pièce de résistance is the generous addition of Cascade and Simcoe dry hop for a huge citrus/apricot aroma.